Today I want to write about a fish that has a very scary reputation. These ferocious fish measure up to 33 cm long (about 1 foot). 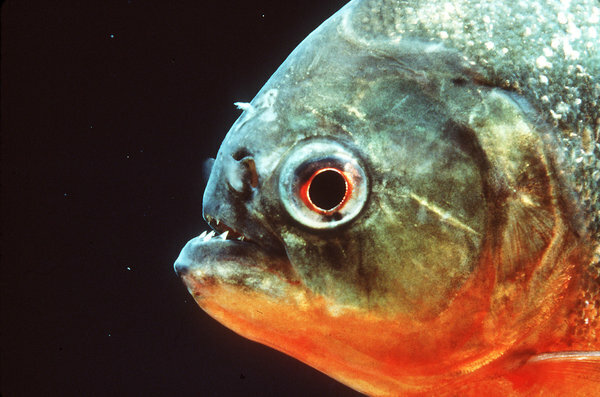 Despite their scary reputation, red-bellied piranhas mostly eat insects, crustaceans, small fish and even plants. They are also excellent scavengers, eating animals that are already dead. They often live in large shoals of a few hundred, but they do this for protection, not hunting purposes. However, if food is scarce and they are starving, they have been known to attack large prey, using their razor sharp teeth, powerful jaws and short snout to strip an entire animal down to its bones in a few minutes. At breeding time, males make a nest out of plants that the females use to lay up to 5,000 eggs. They live in rivers, streams and lakes throughout South America and are very common. They are often also kept in aquariums. Are there any other interesting facts that you would like to share about red-bellied piranhas?